(July 19, 2003) A dynamic, upbeat Pride Parade and Festival, Cirque La Gay, drew a crowd of 10,000 as members of the GBLT community fearlessly showcased the complexity of human potential. The parade from East Ave. to Manhattan Square Park featured 54 organizations, 800 people, from Rochester, Buffalo, Toronto, Washington, DC, and Florida, noted founder and organizer David Kosel. We started eight years ago with a Gay Pride March. The events today have taken gay pride from a one-day event to a week-long celebration. Rochester Pride Week 2003 offered interfaith services, athletics, films, and social events. An all ages show, The Little Prince will be presented as the second show of a double bill performance including The Yellow Wallpaper by Charlotte Perkins Gilman at the Visual Studies Workshop at 31 Prince Street beginning July 25th and running through August 3rd, 2003. Performances are Friday, Saturday and Sunday at 8:00pm. Single tickets range from $8-$10 and may be purchased at the Bread and Water Theatre Box Office in person or to reserve tickets call (585) 538-2105. An all ages show, The Yellow Wallpaper will be presented as the first show of a double bill performance including The Little Prince by Antoine de Saint-Exupéry at the Visual Studies Workshop at 31 Prince Street beginning July 25th and running through August 3rd, 2003. Performances are Friday, Saturday and Sunday at 8:00pm. Single tickets range from $8-$10 and may be purchased at the Bread and Water Theatre Box Office in person or to reserve tickets call (585) 538-2105. (July 13, 2003) “This is Bonnie to Security. We have some people here passing out something,” said a festival official into a cell phone about to kick out a handful of activists. After a few minutes of negotiations Bonnie proved to be a compassionate person as she directed the activists to a spot a few feet away, but on the other side of the gate, to continue their prank. The Creative Protest Affinity Group passed out applications for sweatshop jobs at the Corn Hill Festival today. Cythia will be speaking at two events this weekend along with Ed Kinane, fellow peace activist. 1- People’s Picnic Cookout and Speakout- Free food, hip hop beats and free stylin’ rhymes. Cynthia and Ed will break bread and tell their stories under a shade tree in the park with peace and hip hop activists. A young Iowa woman's return to her native Guatemala becomes a searing journey of self-discovery and political awakening. At a meeting sponsored by the Rochester Ladies' Anti-Slavery Society on July 5, 1852, Fredrick Douglass delivered a speech that took aim at the pieties of the nation -- the cherished memories of its revolution, its principles of liberty, and its moral and religious foundation. The Fourth of July, a day celebrating freedom, was used by Douglass to remind his audience of the shame of slavery and liberty's unfinished business. A good read for July 4, 2003. Read more about Frederick Douglass, "What to the Slave is the Fourth of July?" Four members of Poor People United, and a St Josephs Catholic Worker, joined The Kensington Welfare Rights Union for an encampment of poor and homeless families and supporters entitled “Bushville II”, on an open lot in North Philadelphia. This tent city will draw attention to the issues of poverty in America July 1st through 4th while fighting for economic human rights for all. (July 3, 2003) This morning a group of activists, organized by the Rochester Committee on Latin America (ROCLA), loaded the Pastors for Peace truck en route to Cuba with over $2000 for medicines as well as boxes of prostheses, infant medications, computers and bicycles, all donated by members of the community. 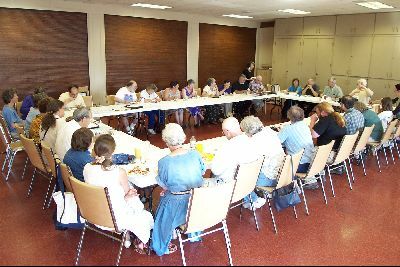 Approximately fifty local activists joined together to share their bounty & break bread at the monhtly Potluck for Progressives on Monday, June 30th. BOTCHED JUNE EXAMS DEVASTATE OUR KIDS! Bring your friends, your enthusiasm, your voice and a banner! less than 30% of children across the state passed. for these exams with NO ACCOUNTABILITY to taxpayers, teachers or students. For additional information on the manipulation of test scores, check out the physics' links on this site. and allowed to graduate this year if they maintained a passing average. The entire community is invited to come out and celebrate Juneteenth on June 14, 2003. The celebration will take Place at the Flint Street Field (corner of Flint Street and Jefferson Avenue) --- 12:00 PM until 5:00 PM. freedom. It is a celebration of African American history, in honor of the time period when the last enslaved African Americans received word that slavery had ended. (June 10, 2003) “1 2 3 4, We won’t let you screw the poor,” chanted a crowd gathered in front of the County Office building this evening before the Legislature meeting. The homeless, were joined by social workers, advocates and activists to demand that the Department of Health and Human Services provide the mandated assistance to the poor.